I've decided to count my calories the first month of this year. I told myself that I am tired of carrying a heavy body which makes me feel weaker too, and so the only thing that I need is to help myself from consuming too much calories that would turn into body fats. Eat moderately and according to my weight preferences, is my goal to accomplish this year. I did struggle for the first month as the only thing that keeps bugging in my mind is to eat more food. Counting my calories is one thing that helps me lose the weight before and I'm very much confident that this would be the only diet plan that will work till now. I need to manage and ensure to have the exact calorie intake every day in order to reach the goal weight I desire. 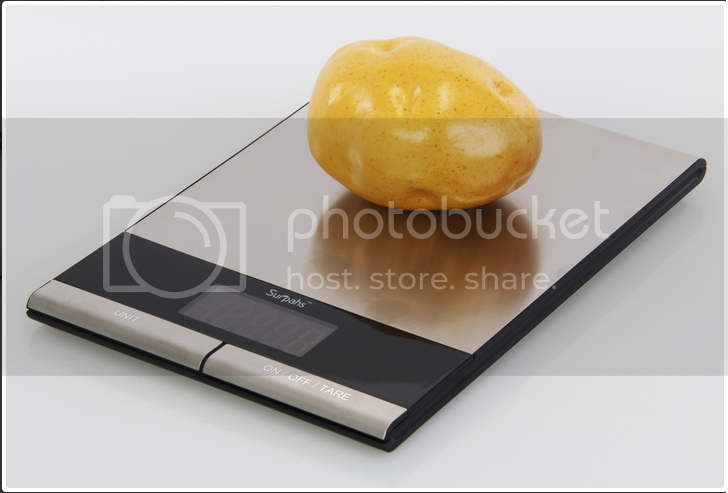 I'm even thankful that I don't need to guest-timate [estimate guessing] and eat the exact weight of food with the use of Surpah's Digital Kitchen Scale. Aside from its purpose of food measurement in cooking or baking it still have another purpose for me, to weight the exact amount of food I can take. 0.6 inches thinner design, commercial grade stainless steel weigh platform. 4 high precision weigh sensors to support accurate measurements. Small, lightweight, portable and stylish design. Large buttons generate an audible click confirmation. Powered by 2xCR203 Lithium batteries (included), 100% product and shopping satisfaction guaranteed. It is very simple, it is digitally operated very light weight kitchen scale and of course I love the astonishing color and design. I don't need to put anything on top, but simply easy to use. Can weigh up to 11lbs or 5 kg maximum, I adore the thinly made kitchen scale, it's as thin as an iPad tablet and much lighter too. Overall, my experience with Surpah's Digital Kitchen Scale is great. It helps me get the right weight on the foods I eat as well as gives me the accurate weight of measurements whenever I bake or cook. If you desire to possess your own digital kitchen scale you may always find the product at http://www.surpahs.com and also buy at Amazon with a value of $22.98. A disclaimer: This is NOT a sponsored post. I received SURPAHS Precision Digital Kitchen Scale, Food Scale - 11 Lb/5 Kg - Stainless Steel product for free in exchange of my honesty review. I like that it's compact and very affordable. It looks durable too. I think im gonna need this too. Gonna use my amazon gc. I don't really watch calorie but I have always followed control portion technique and it works.